Since I’m on this magnet kick, I decided to do that. I admit that it might be a bit cheesy to have a personalized wedding magnet but I figured it’s better than them tattooing each other’s names on themselves! The magnet itself is very simple. The card, however, is a totally different story. I decided I would house this magnet right inside the card so that I can put it in the card bin with everything else. It’s just easier than passing it on to someone for safekeeping for the night and risk it getting lost in the partying with my cheque inside! I made the card big: 5 x 7. I also used a whole arsenal of tools to make it! I can’t recall when I last used so many things on one project! Firstly, I cut all the pieces with my Bosskut Gazelle. The doves are a design by Bosskut Designs. The lacy circle and sentiment frame I drew myself in the software. Next, I used my Quickutz/Lifestyle Crafts Epic Six to emboss the lacy circle with a Stampin’ Up! embossing folder. I also reached for my Stampin’ Up! stampajig to stamp the sentiment squarely in the frame. Lastly, I used my newest tool, the Cropadile Big Bite to set the eyelets. I actually crushed the eyelets the first two setting attempts but, once I figured out the pressure, the second frame was finished just fine. It's been a while since I participated in a card making challenge. It's a long weekend in Canada and I told myself that, if ever I will find the time to participate, it is this weekend. So, here is my entry for the Mojo Monday Sketch challenge 191 - submitted JUST under the wire before tomorrow's new sketch comes out. 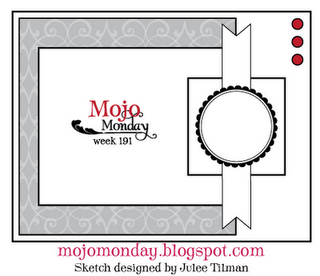 This is the sketch from Mojo Monday's blog. This sketch site is one of my favourites. Their sketches are very clear to see and their design team is great at turning and flipping sketches so you can see it from all angles. I turned mine to a portrait orientation with the ribbon strip at the bottom and I left out the square. My ribbon strip is just a paper strip though. This is another image from A Day for Daisies digital stamps on Etsy. I had mentioned the story-telling quality of her images before and she has since released a Snow White and Cinderalla-esque set of digital images. (So lovely!) You can check out more on her blog, if you like. I coloured my fairy with Copic markers, blending a red and yellow for the wings. I also used a sparkle gel pen to colour the orange flowers in her dress, but it doesn't show up well in the photo. The shading in the hair (hardly visible in the photo), was done by blending a Copic marker and a Promarker since I don't have two yellows in Copics. In closing, hooray for Mojo Monday helping me to keep my Mojo flowing! Just a quick post from me today. I've been working on a new thing for my shop: magnets. Really, I should be taking and editing pictures of my volumes of cards to list, but that's boring! We had guests this weekend so I had to pick and choose what I would spend my time doing and making brand new stuff was more fun. This is the prototype. There's one on my mother-in-law's fridge and this one is for mine. It's pretty plain in the background so I'll tweak it before it lands in my shop. I'll have to get more magnets first though! I've burned through the three trial magnets I bought. What do you think? I got some new butterfly stamps from Hampton Art when I went shopping on Mother's Day with my sister. I love them. I coloured this one with one Copic and one Letraset marker (soooo happy these markers play nice together!). I used a Sakura sparkle gel pen on the green dots in the wings and a gold-ish one inside the wings (click photo to enlarge). The paper die cut flowers are my own design. I exhausted my pearl stash on making these two magnets, so I will have to vary the design again. I plan to play around with some designs over the coming long weekend and hope to have some listed within a couple of weeks! These guys are 3 x 3 inches - quite a decent size that should be able to hold up a full 8.5 x 11 sheet of paper on your fridge or office cupboards. Great for recipes and childrens' artwork! Today is my nephew's first birthday. So, I made sure that one of the cards from my embossing workshop for charity was a birthday card. I made it gender neutral - a small swap of colours would make this card suitable for either a girl or boy. I was desperately poking around the web for a last minute digital stamp suitable for a masculine birthday. I searched for "birthday", "cakes", "cupcakes" (men and food go well, don't they? ), "party". I found lots of great images (and snagged a few) but nothing really caught my eye for my nephew. Then, I saw one where a critter was peeking out from behind a gift. It wasn't quite what I wanted but the gift was easily reproduced. So, I scrounged through my die cuts to figure out what to pair with it. This is the Santa Bear that I designed on my Bosskut Gazelle. I may even put his Santa hat back on and use this design on my Christmas cards this year. I could cut his hat and the gift from patterned papers if I liked. Here, I used a Stampin' Up! background stamp to create the gift wrap pattern. Here, we used the embossing just as an accent. I will be giving this card to my nephew at his party later. I have written a little First Birthday poem for the inside. Feel free to use and adapt as necessary! Hope your day is really fun. With gifts, of course, and some cake too!